At around 8 am, and just about 70 degrees Fahrenheit, many Centris Bees were actively collecting among the bright yellow flowers that are just beyond their prime by now. But equally many were still asleep, clinging to twigs with their tarsi, but even more firmly with their strong mandibles. Most insects are ectotherm, meaning that their body temperature depends completely on environmental factors and fluctuates. They can only regulate it somewhat through their behavior. 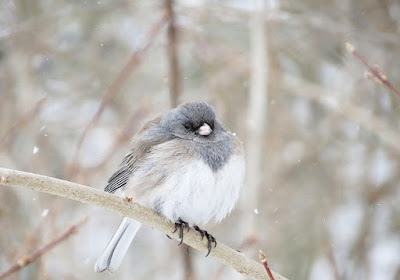 Birds and mammals produce and regulate their body temperature actively through endogenous mechanisms (shivering, panting, sweating, addipose tissue metabolism), which makes them endotherm (this is not to say that they do not use behavioral means of thermoregulation in addition). But there are exceptions among insects. 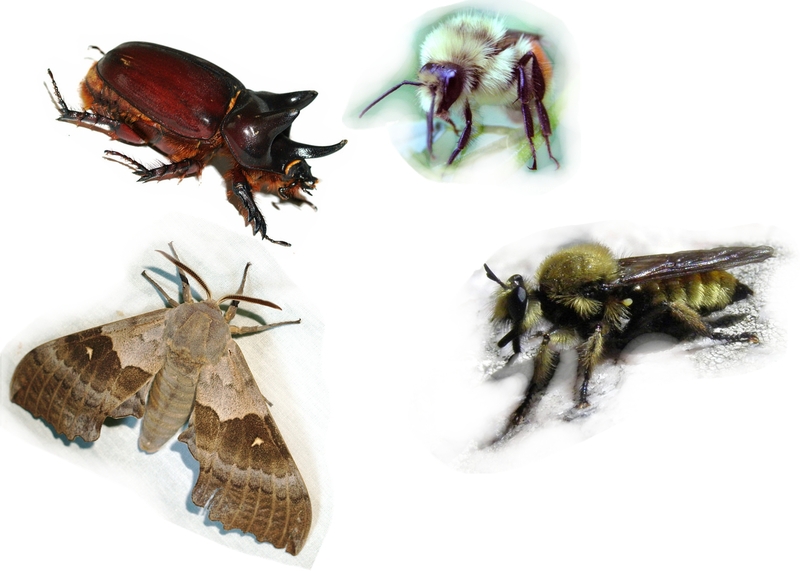 Big hairy bees and big active sphingid moths, as well as some big beetles and Robber Flies (my own observation) are able to elevate their body temperature using muscle activity that does not translate into movement or at least locomotion, just like their avian and mammalian counterparts who shiver to get warm. Birds and mammals maintain high body temperatures almost constantly. Times of hibernation and nightly torpor phases in some few species are the exceptions. In contrast, facultatively endotherm insects are ectotherm most of the time. That saves a lot of energy. They actively increase their body temperature only when needed. Flight is a very demanding way of locomotion, and the flight musculature of most insects is only operational when warm enough. Maintaining this high temperature requires a great energy investment, especially in small organisms with a less than optimal body-mass-to-surface-area ratio. Note that all part-time endotherm insects are comparatively big and hairy, at least as insects go! So even those big hairy bugs don't keep their temperature up constantly. 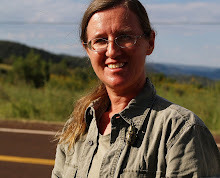 B. Heinrich found that bumblebees only fly at cold environmental temperatures when their investment yields a worthwhile return - meaning that they fly among nectar-rich flowers, but stop, rest and crawl if the available flowers are of minor quality. 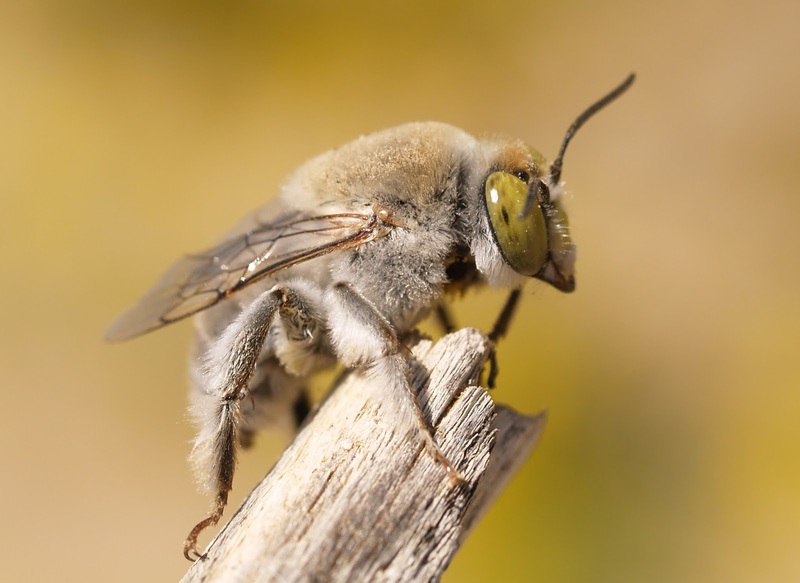 While the flying bumblebees maintained high body temperatures, body temperature of the crawling ones quickly fell to the level of the environmental temperature. And before they could fly again, they first had to warm up. So on this cool morning, the palo verde flowers, a little past their prime, were a still worthwhile investment to most of our bees, but not to all of them. And those who were not flying and active were still really cold and unresponsive. There were sleeping females as well as males, debunking the myth that females always sleep in their nest burrows. They may do so, often, because they often spend the sunset time digging (own observation). So when it gets dark and cold they just stay in the burrows. But they also camp out among the flowers when that's where nightfall catches them. The sleeping bees do not warm up quickly. While it is usually difficult to get a close look at those constantly hovering Centris Bees, this is an opportunity to study them. Sexual dimorphism is in the details. While both sexes have big green eyes in this species, the area between the eyes is white in males. It looks like the reason is the much larger clypeus. 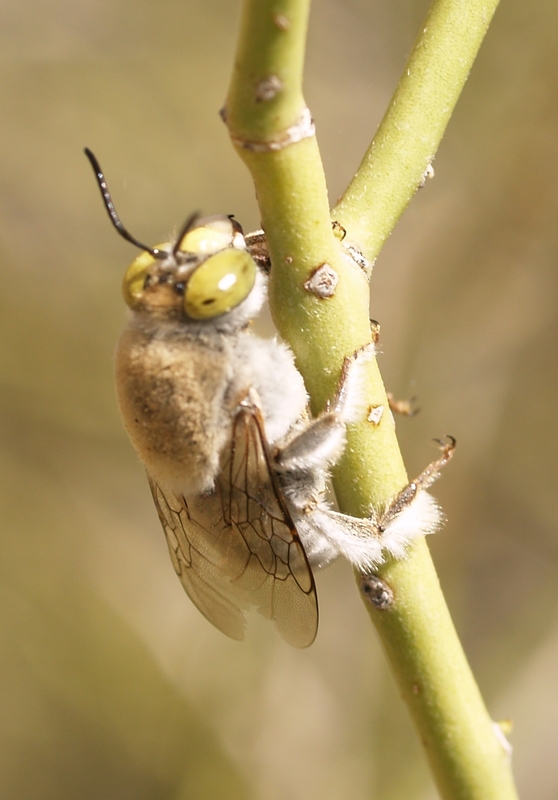 This feature is shared with many bees, and interestingly some male beetles also have more white in their faces. The faces of the female bees are more fuzzy and grey. Another difference: his eyes are bigger and more bulging. Male Centris bees are extremely eager suitors, to the point that they try to dig up their late-born sisters to mate with them. 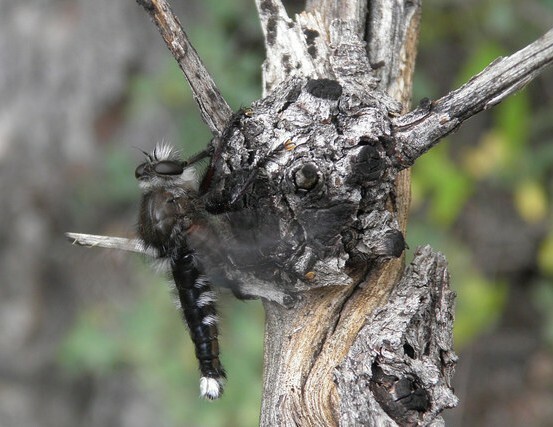 Much of that activity is pheromone driven. But often, the males also relentlessly pursue flying females. Those big bulging eyes - to better see her in three-dimensional space? Only females build nests and collect provisions in form of pollen and flora oils, a specialty of Centris (and Epicharis), so only females show special adaptations for the transport of those substances. Their hind tibiae are covered with long, dark hairs densely covering the hind leg - the scopa. 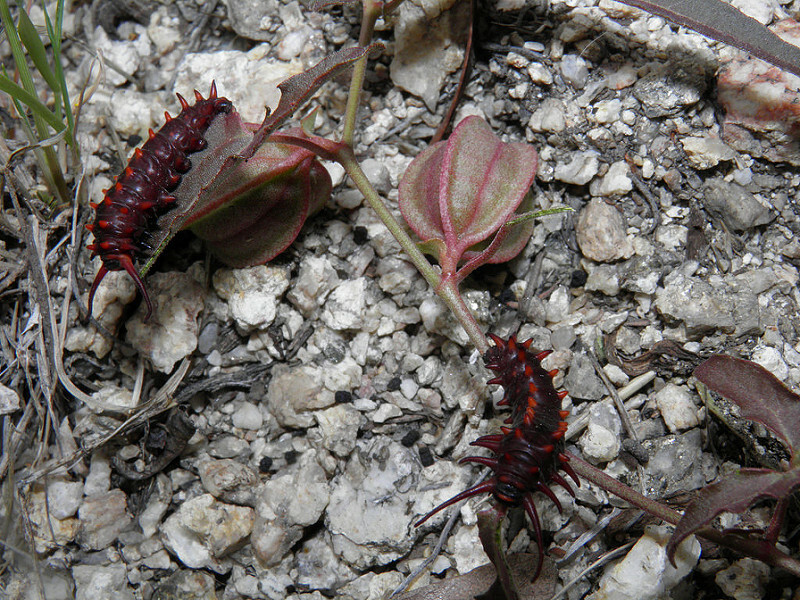 There are also long bristles arranged like a comb on the front legs. I often see Centris Bees hover and use their front legs in grooming motions - probably combing pollen and oils from all over the body and stuffing it into those hind-tibia brushes. Maybe that comb of setae is also useful to dig in the loose sand? 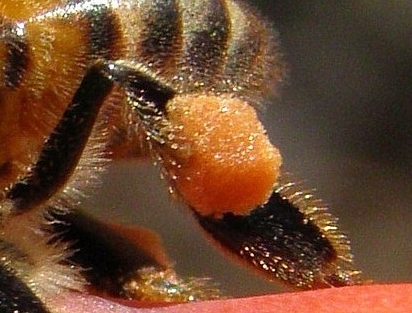 The hairy tibia of Centris and Epicharis is considered the evolutionary precursor of the corbicula (pollen basket) of the apidae (orchid, honey, carpenter, bumblebees). Here is another look at the male Centris pallida - he does not have those brushes of long hairs on the hind tibiae. Lastly, he also has no ovipositor and that means no stinger. I have handled individuals of both sexes when they were still too cold to fly and none tried to sting me, but I'm too careful to find out whether that is the rule for Centris Bees. They are certainly not as aggressive as social bees and wasps but the females probably can sting. Literature quoted: The corbiculate bees arose from New World oil-collecting bees: implications for the origin of pollen baskets. Martins AC, Melo GA, Renner SS,Mol Phylogenet Evol. 2014 Nov;80:88-94. doi: 10.1016/j.ympev.2014.07.003. Epub 2014 Jul 15. Our most common desert Swallowtail is called after it's foodplant Aristolochia, the Pipe Vine. It is a A trailing or climbing vine with stems up to 3 feet (0.9 m) long. The 1 inch (2.5 cm) long, arrow-shaped leaves are usually dark brownish-green when growing in full sun. 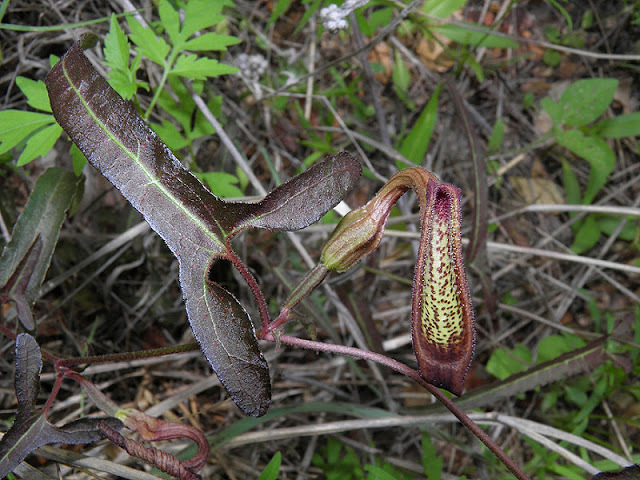 The tubular-funnel form flowers are about 1¼ inches (3.8 cm) long, green with brown spotting.Supposedly the flowers reminded earlier botanists of the pipes that Dutch sailors used. As the great grand daughter of a German pipe smoker, I can see the similarity. 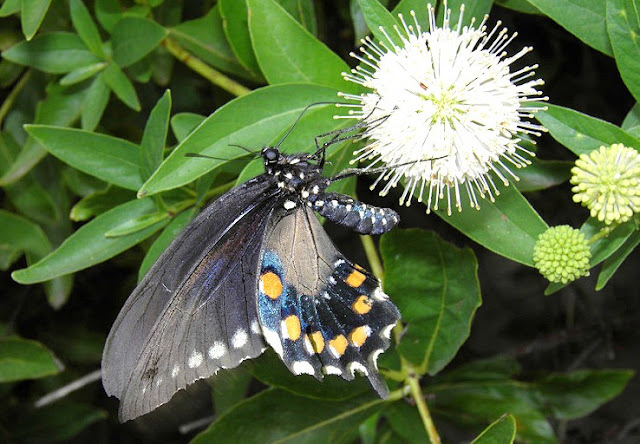 By the way, the Swallowtail lays its eggs on the plant, but it does nothing to pollinate the flowers. Pollination is left to much less obvious little insects. They are small, blood sucking insects, some of the no-see-ums that pester humans and other animals on warm, humid summer days and often seek access to the bloodvessels in rodent ears that are especially highly vascularized in desert species (thermoregulation!). The Pipe Vine grows usually in the shady, humid micro climate under shrubs -ideal micro habitat for the little flies. 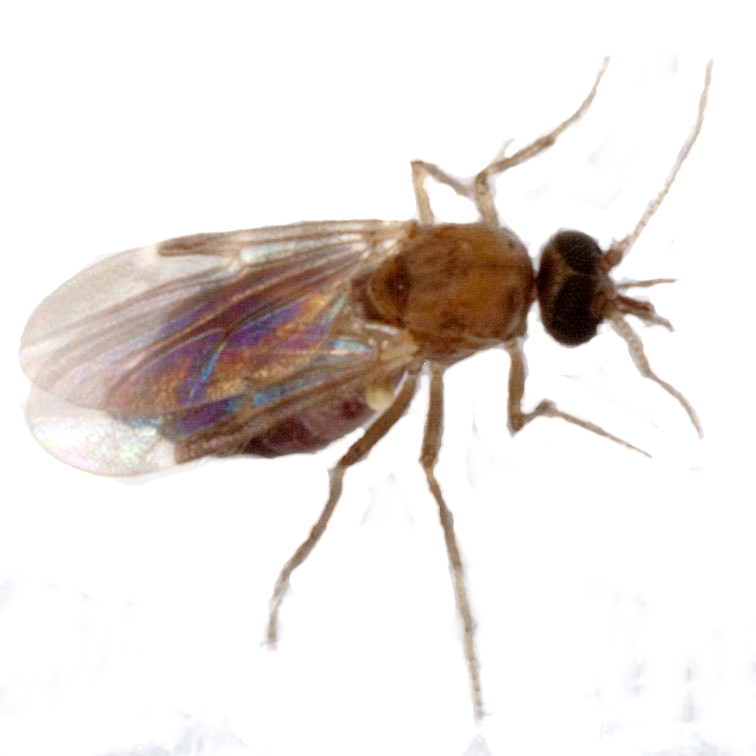 Drawn by odor and ear-like shape of the flower, and expecting a blood meal, the midges enter. The shape of the flower and inward-directing hairs in its narrowed throat trap the flies temporarily, often over night when pollen release is at its peak.. In their attempts to escape the flies dislodge pollen and transfer the pollen they may have already bought with them to the stigma. In the morning the pollinated flower releases the captives. Because the flowers provide super-stimuli, the flies' instinctual reaction is to fall for the same deceit over and over. 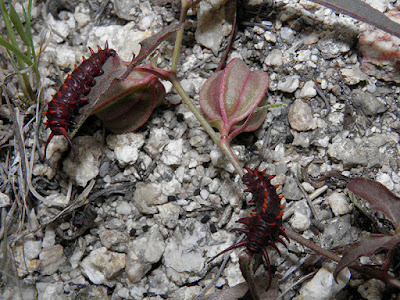 So this is another striking example how plants secure the pollination services of insects. No reward (nectar) is offered in this case. Since my last blog I took a great trip to the Californian Desert over Easter and there will be a write-up about that later. Since then I've been through one of the more difficult times I can remember and the last three days of trying to finish our taxes in time in spite of everything were the most easy and pleasant part. But now I'm taking a deep breath, of course outside with dogs, looking at flowers, birds and bugs. It's early morning, and big Desert Iguanas are only half out of their burrows, basking and warming up their sluggish bodies. Their favored environmental temps are above those of Spiny, Side-blotched and Zebra-tail lizards. Over the last 10 years, the numbers of the Iguanas seemed to go up while the others declined. Ornate Tree Lizards also used to be much more common, but today I find one that is fascinated by a bunch of male Leaf-cutter Bees dancing around a tree hole where virgin females must be ready to emerge. Right at the border between our land and the State Trust Land, long before we have entered the usual sensitive area around the Red-tail nest, I hear the scream of the Dark Female. Above us rages an aerial battle. Both hawks and three Common Ravens, also residents that have been around for years, are dive bombing and chasing each other high above our heads. I can't tell if the ravens are closer to the camera than the hawks or if they are actually as big or bigger than even the female. At least the male hawk has shown up for this - I rarely get to see him. By the time we reach the nesting saguaro, Dark Female has shaken the company and is screeching at me by herself, as usual. I have stayed at a save distance from the nest while she was sitting on eggs and small chicks, but now that she is usually up hunting I go close enough to finally get a glimpse. At least 2 chicks, already changing out of their fluffy down stage. We are very lucky to have these hawks here: they have been using 2 nests in neighboring saguaros at least since 2010. The female is such a rare dark morph that she is easily and individually recognizable. She has raised 2 or three chicks to the fledgling stage every spring. For months afterwards we can even follow the young hawks around while their activity radius grows wider and wider. I'm heading for some blooming Cat-claw Acacias now but the dogs are getting adamant: they are hot and thirsty and hide in the shade whenever I stop. So soon we had back for the bathtub on our patio.